Chicago United's Five Forward program "will have a long-term impact by helping to create scale for minority-owned companies, making them more competitive on a regional, national, and international basis," says Gloria Castillo. When Gloria Castillo was in high school, people constantly told her that she was always cheering on someone else’s banner. She considered it her personal commitment to push for equality regarding social and economic justice, so even at such a young and impressionable age, her peers’ recognition of her efforts was more complimentary than offensive. “It was always my passion,” she shares enthusiastically. “I joined the women’s movement and found that my drive was fueled by the desire to be part of change; not the weight of stagnate status-quo acceptance.” Today, she finds herself the first Latina president of Chicago United, a 42-year-old advocacy organization that works to build sustainable diversity in Chicago-area business leadership. Hispanic Executive caught up with Castillo in Chicago, and she offered some highlights of the group’s ongoing projects. The focus of the advocacy group Chicago United as a whole is to bring together Chicago’s nationally recognized leaders in order to identify trends and benchmark areas of improvement and overall representation in three essential areas of concern: governance, management, and business diversity. Its goal is to identify and promote multiracial leadership in all areas of business, specifically to identify and promote minority executives as candidates for corporate boards in the Chicago area and nationally as well. Finding a true corporate commitment is essential because it has to be fully supported and engaged in from the top on down through the corporate structure, Castillo says. Developed to attract competent, competitive, and capable candidates for nomination to Fortune 1000 corporate boards of directors, the Business Leaders of Color initiative utilizes both quantitative and qualitative measures to identify the list of honorees from a pool of nominees. The biannual publication provides a portfolio of top business executives that have successfully gone through an open nomination process that equally scrutinizes business understanding and effectiveness, ranking each on specific criteria. “The final selection process is rigorous and thorough,” Castillo explains. The high-performing executives are presented at Chicago United’s annual Changing Color of Leadership Conference, and the publication, which profiles each of the 45 finalists, is sent to the Fortune 1000 CEOs for consideration of future board of director openings, she says. Five Forward is a strategic plan to build a stronger economy in the Chicago region by building minority businesses of scale. Corporations that are stakeholders in the business community and key drivers of the region’s economic health exhibit their commitment to this economic-growth plan by selecting five minority firms with whom to do business over a period of five years. Because the minority-owned firms can plan, build scale, and create sustainable jobs in communities of color, they can become strategic partners rather than transactional vendors. What do you find works best to create synergy amongst diverse backgrounds? and intentionally listening to the people around you. To dedicate more time to close friends and family, particularly if I can spend that time traveling … I have always found those experiences to be personally rejuvenating. “The program will have a long-term impact by helping to create scale for these minority-owned companies, making them more competitive on a regional, national, and international basis,” Castillo says. “With the commitment of Chicago’s large to midsize businesses, the impact is sure to be significant. It will build the tax base, improve education, make a stronger regional economy, and create a stronger, vibrant community.” Additionally, several larger minority-owned firms have also made a five-year commitment to utilize the services of up-and-coming minority businesses to help them build scale. This is more than just a revenue commitment; it is also mentoring through leadership, she says. 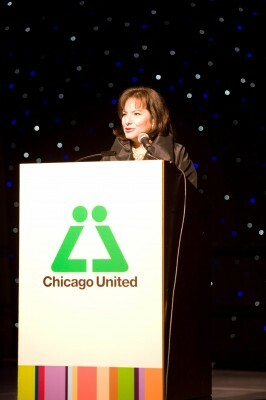 The Chicago United Bridge Award represents the first national award that honors two CEOs who exemplify and advocate for multiracial diversity in corporate governance and executive-level management. A Chicago Bridge Award honoree and a national honoree is presented each year at the Changing Color of Leadership Conference and Bridge Award dinner. The dinner is attended by more than 1,200 Chicago executives. The conference features a prestigious luncheon keynote speaker, and three CEO-level speakers leading symposiums that explore issues relevant to senior leaders across the business community, Castillo describes. “The conference is an excellent opportunity for the Chicago business community to come together to explore relevant issues as far as greater inclusion in the actual business community,” she adds. The event also facilitates networking among participants. As the Bridge Award conference is continuously evolving, its venue is a major attraction that shares the commitment and the solid performance of effective leaders who seriously and continuously bring new information, participation, and professionalism to diversity and inclusion initiatives.